Karnov (カルノフ, Karunofu?) is a 1987 platform arcade game developed and published by Data East. It is the debut of Data East's mascot of the same name. This game was later ported to numerous home consoles, such as the NES, Commodore 64, ZX Spectrum, and a Tiger Electronics handheld. Karnov was released for the Famicom on December 18, 1987 in Japan, and the NES in January 1988. Although it plays very similarly to the arcade version, there are a few changes, most notably the ability to take two hits before dying. The game puts the bulging-muscled, fire-breathing, ex-circus strongman east-Russian/central Asian hero on a quest through nine different levels to search for treasures. Players can make Karnov walk, jump and shoot his way through these levels and find special items that will help him on his way. Each level contains a variety of strange enemies, such as gargoyles, rock creatures, and strong men, which Karnov must destroy or avoid. When he reaches the end of a level he usually has to face one or more powerful enemies which he must defeat to beat the level and receive a new piece of a treasure map. At the end of the game he must face a powerful boss often called "The Wizard" and collect the treasure. Karnov became Data East's mascot, and was present in many other Data East games, including Bad Dudes Vs. DragonNinja in which he played a boss in the first level. 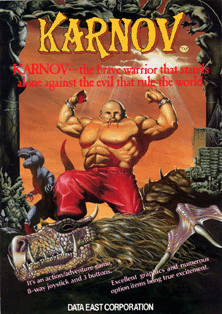 Karnov later appeared in 1994 in another one of his own games for the Neo-Geo called Karnov's Revenge. This game, also known as Fighter's History Dynamite, is not a sequel to the original Karnov, but to Fighter's History, a fighting game in which Karnov was the final boss. This page was last edited on 25 June 2012, at 10:27.